On Tuesday 24 April 2007, Archbishop Hickey and Rev Father Brian O'Loughlin (Chairman, Parish Gifts Committee) warmly welcomed over 220 Archdiocesan priests and representatives from parishes throughout the Archdiocese to a special briefing function. The purpose of this gathering was to afford for the Archbishop and Father Brian an opportunity to personally provide information in advance of the Cathedral Appeal Launch to Parishes on the weekend of Saturday 19/ Sunday 20 May 2007. 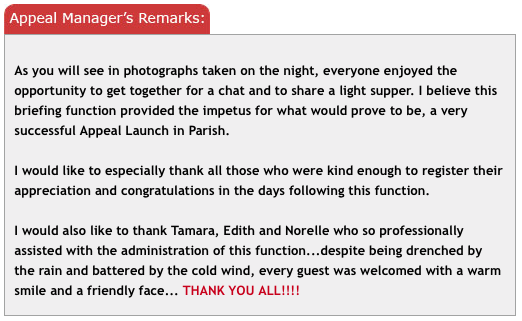 Despite unbelievably bad weather on the day, the night actually turned out to be a fantastic occasion, one thoroughly enjoyed by all the guests. It was great to see so many parish and retired priests, deacons and members of our parish communities attending this event. With grateful thanks to Father Peter Bianchini, the presentations were conducted at the Sacred Heart Church in Highgate, and hospitality provided afterwards (by necessity due to the weather) at the Seminar Room in the Pastoral Centre and from marquees (hastily erected on the day) to shelter the guests. His Grace and Father O'Loughlin spoke passionately about the Cathedral Project, its importance to every Catholic and urged parishes and parishioners to support this important appeal. A special extended version of the appeal dvd - THE PARISH APPEAL DVD - was screened and each parish provided a "BRIEFING KIT" explaining what appeal materials would be provided and details on when and how to conduct the appeal. Parish Priests were asked to make special arrangements for THE PARISH APPEAL DVD to be screened at each Mass on appeal weekend. Parishes without the necessary equipment would be assisted by the appeal administration office to ensure everyone was able to participate fully. Parish priests and representatives were shown for the first time the PARISH APPEAL BROCHURE packs which contained a letter form His Grace and a copy of the Parish DVD that were to be distributed to every parishioner in the Archdiocese on the appeal weekend.